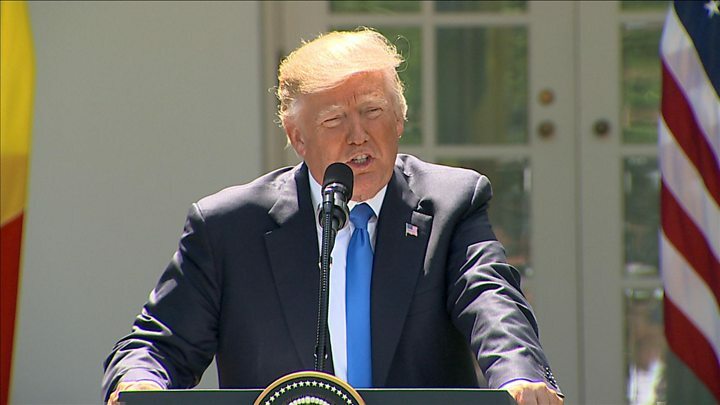 US President Donald Trump says he is "100%" willing to speak under oath about his conversations with ex-FBI chief James Comey. Speaking at the White House, he denied having asked for Mr Comey's loyalty or for an inquiry into a former White House aide to be dropped. "James Comey confirmed a lot of what I said, and some of the things he said just weren't true," Mr Trump said. Meanwhile, a congressional panel asked for any tapes of their conversations. Mr Comey says Mr Trump fired him because of his Russia inquiry. The former FBI chief was investigating an alleged Kremlin plot to sway last year's US election in favour of Mr Trump, and whether there was any collusion with the president or his campaign staff. On Thursday, Mr Comey testified to one of several congressional committees that is also looking into the Russia claims. He said the president had pressured him to drop a probe into former National Security Adviser Michael Flynn, whom Mr Trump fired for misleading the White House over contacts with Moscow's ambassador. Under oath, the former FBI director also told the Senate Intelligence Committee that the president had asked him during a one-to-one dinner at the White House to pledge loyalty. Nearly 20 million US television viewers tuned in to the explosive testimony. 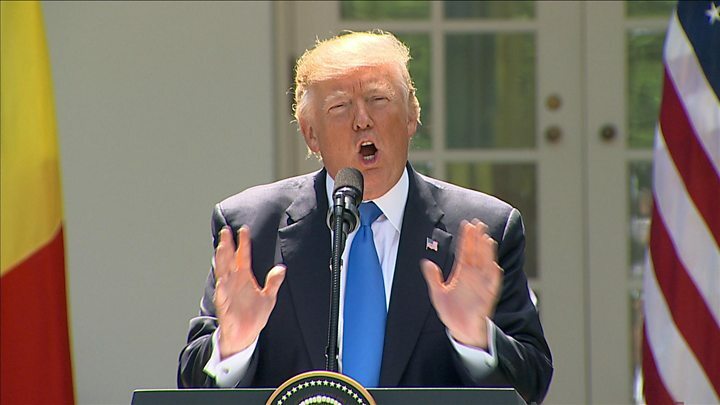 At a press conference on Friday afternoon in the Rose Garden with the visiting president of Romania, Mr Trump rejected Mr Comey's claims. He said the former FBI director's testimony showed there was "no collusion, no obstruction". 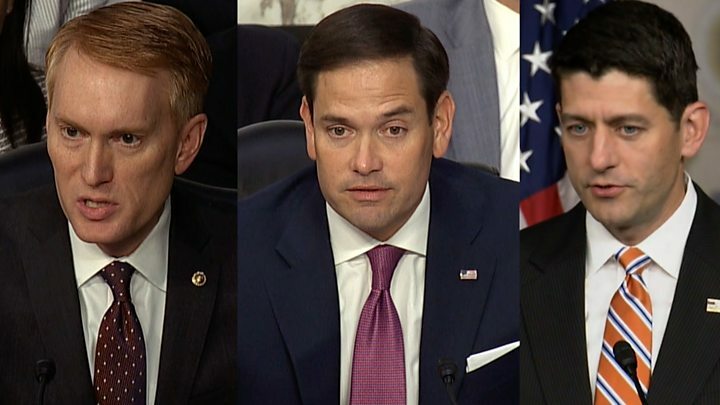 Mr Comey told senators he had assured the president he himself was not under scrutiny over Russia. The US president was asked by a journalist if he would be willing to give his version of events under oath. "One hundred per cent," Mr Trump said. "Who would do that? Who would ask a man to pledge allegiance under oath? I mean, think of it. Media captionTrump will talk about Comey hearing in the "near future"
"I hardly know the man. It doesn't make sense." When asked about whether he had recordings of his conversations with Mr Comey, which he has previously hinted, the president said he would address it at a later date. "I'll tell you something about that maybe sometime in the very near future," he said on Friday. "I'll tell you about it over a short period of time. I'm not hinting at anything." Shortly after the press conference, leaders of the House Intelligence Committee said they had asked the White House whether there were any such tapes. The House panel requested that if the recordings exist they be submitted by 23 June. The Senate Judiciary Committee asked the White House last month about such audio. 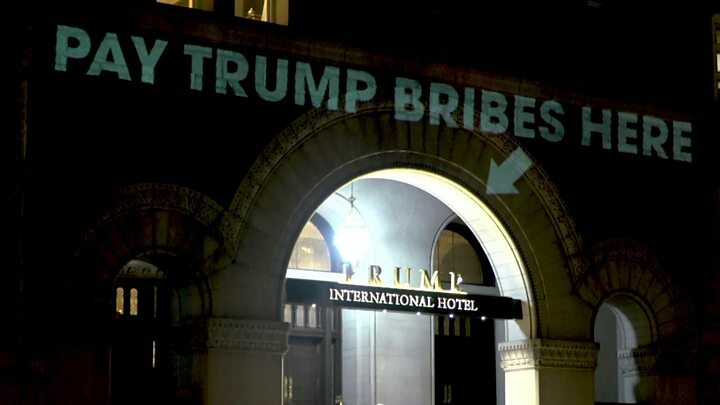 Media captionWho is behind the projections on the Trump Hotel? Days after he fired Mr Comey on 9 May, Mr Trump tweeted: "James Comey better hope that there are no 'tapes' of our conversations before he starts leaking to the press!" 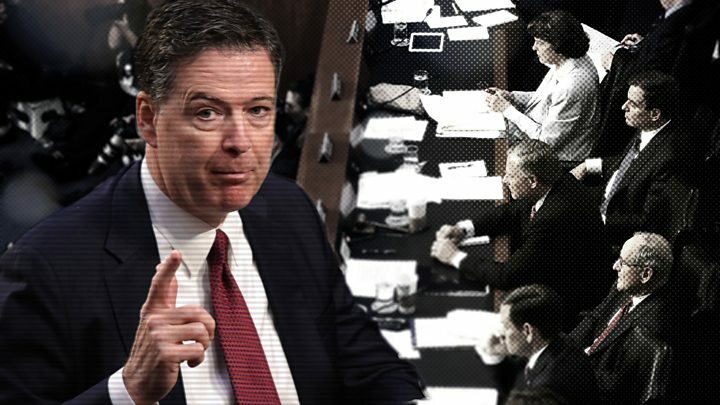 Mr Comey also told senators that he had leaked details of his memos about his conversations with Mr Trump to a friend, who passed them on to a reporter. After the testimony, Mr Trump's lawyer accused the former FBI chief of having divulged "privileged communications".